This was a unique spin on a zombie story, telling the story from the zombies’ point of view. The main character, Jessie, was killed in a car crash with her parents when she was just 15 years old. After her rebirth, she joined a gang called the “Fly-by-Nights” whose initiation involves getting the crap beaten out of you. Assuming you survive, you’re in! The zombies or “undead” can communicate telepathically, which is a good thing since many of them have no vocal cords left due to the deterioration of their bodies. Jessie goes back to the cemetery where she was buried nine years earlier, and she finds her older sister Lisa there. She tries to communicate with Lisa, but she just ends up terrifying her. Lisa told Jim, their brother, about seeing Jessie and he is convinced that the undead are still thinkers and can communicate. He works for a lab, which was tinkering with viruses to try to find a method to eradicate the undead. Jim had his own agenda, however. He wanted to find a way to make the undead human again. He secretly mutated the specimens before they were released, and his plan was successful. Not only did the undead stop decaying but they grew new flesh, but Jim did not count on how the mutation would affect the living. I really liked how Turner humanized the zombies. Her undead don’t just stumble around saying “More brains!” Their gang has a hierarchy, with a leader and rules. Turner showed us how they care about and for one another, even though they didn’t exactly express their feelings in the usual ways. My favourite character was Florian, and I was a little bummed about how he ended up. I already own the next book in the trilogy, Frail, and I’m looking forward to continuing with the series. 4 stars!! 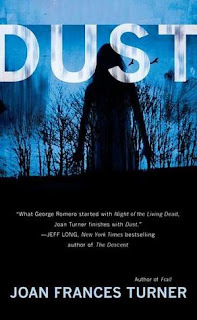 It was really good, and you should put it on your TBR list if you're a zombie fan!